Having had two 'nasties' cut out of my body recently, I have become 'sun obsessive'. On our recent Xmas/New Year tramping trip, Kathy and Hideo wore gloves to protect the back of their hands from sun damage. I was plastered in lotion, but still felt the burn. On my return, I pledged to do some research and get gloves. One could take the budget route and get some basic white cotton dress gloves and cut the fingers off, but getting purpose made is not expensive, $40 from Bivouac NZ. For overseas readers, go to Amazon. 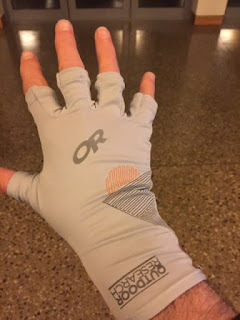 I got a pair of OR Spectrum Sun Gloves. 50+ UPF. They have a long wrist, so mitigate skin expose between shirt sleeve and hand when reaching out (walking poles). They are breathable and made of wicking stretch polyester fabric. This makes them quick drying. 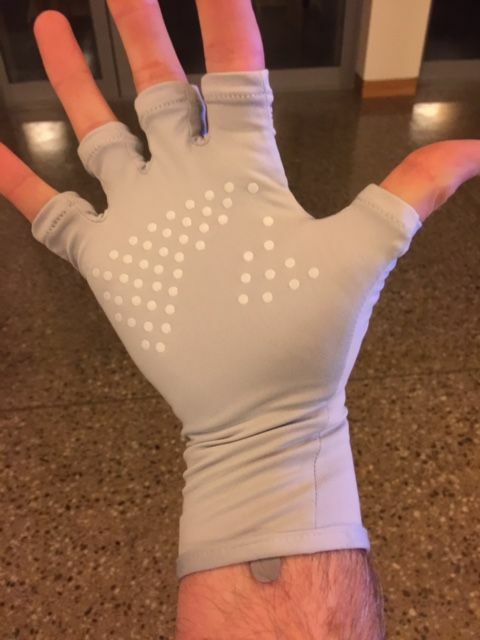 Another feature is the silicone grip dots on the palm. good for those (like me) that use walking poles - no slip. Dare I mention the weight! 19 grams! On the subject of gloves, I once saw a tramper on a wet, cold trip wearing dish washing gloves. Not a bad idea, I'd suggest getting oversize to help get them on and off easier. I have also read about others who wear surgical gloves for wet weather travel. This might put the fear of God into your fellow trampers who may not quite be ready for a prostate check on the trail!. Got yourself a pair of these eh! Hope they serve you well! Tramper.co.nz have a current thread on the glove problem. My hands didn't keep warm enough in wet conditions with those latex types of gloves. I'm trialling the Ninja Ice gloves (developed for working in cool stores). They cost around $10 I think and are lined with a synthetic fleece then overlaid in a sort of rubbery material. Mine are also waterproofed on the palm so I wear them back to front! Well, when I went to get the URL below I had mail from one of the forum guys so have just bought online a pair of fully lined gloves i.e. have the waterproof coating all around. It's costing me $30 as there's $10 freight but that's OK. I'll let you know how they go but it won't be until the winter! Ive recently started wearing fingerless nylon cycle gloves as my walking poles were chaffing my hands. They are light and work well. they are not waterproof so I just chuck a pair of Goretex mitts on if it starts to rain. I've been using the OR sun gloves too. Love them. One of my favorite pieces of gear!